FileZilla is a proper desktop program, not a toy app. It uses the colors Windows says are the colors to be used. Note that the Linux version can use Dark Mode if the Global Dark Theme is set. The shortcomings are only with Windows. No idea about Mac. @Tim - that seems like a pretty rude answer. Visual Studio is not a toy program, but has a dark mode, other IDEs are not toy programs, but have dark themes. If you wanted to say that FileZilla doesn't bother with themes and only uses what Windows has configured, that would be one thing, but to say that only "toy" programs have different themes is wrong. I have become accustomed to dark themes in almost everything I do as part of my work. I don't use my computer to play, I use it to make money and because of that, I sit at this sucker a great number of hours every day. I'm sure you will blast me because I've seen it before on this forum, but I needed to share my opinion on your response. Just configure the system wide Windows color scheme to be dark. FileZilla uses system colors for texts and backgrounds. With that dialog in Windows you are only configuring the color scheme for UWP apps. Microsoft has removed the ability from Windows to configure the colors or all programs, you need third-party programs or that. Which colors programs should use is defined in the registry under HKEY_CURRENT_USER\Control Panel\Colors, Windows used to have a simple and intuitive dialog to configure these. Contact Microsoft for an explanation why they have removed the configuration option for these. Changing these registry options still works. For example Windows' very own regedit program honors these registry keys, just to name a example. I guess they refer to the ugly, hacky kludge called "Dark Mode". That one is not a system-wide solution, but mostly only works for Explorer (as an overlay of some kind; sometimes you see it blinking white, first). Get a Linux to see properly implemented themes. MS just doesn't have any clue, sorry. It's telling if a multi-billion-dollar company cannot even make use of the functionality that's been in their own operating system since at least Windows 3. While I enjoy a thorough anti-Microsoft drubbing as much as the next man, I have to agree with garyhoffmann on this. 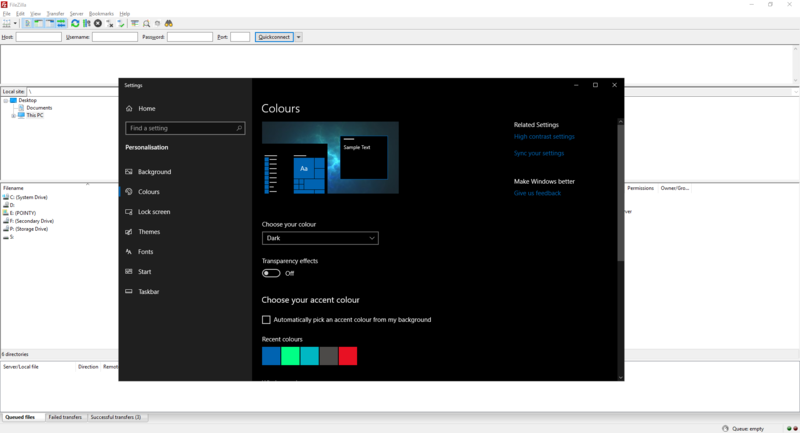 Plenty of native Windows apps offer the use of a dark mode, and what's more... "toy" apps are usually the ones featuring bright, retina-burning themes. Professional productivity apps (Atom, VS Code, Terminal, the entire Adobe Creative Suite, Blender, etc.) almost universally use dark themes... because people who use their computers for work prefer to focus on their work, rather than the burning light of a thousand suns coming from their computer screen just because they need to securely transfer a file to a web server. WinSCP (GPL, supports FTP/SSH, no server) has added a dark theme on Windows - and we've still no word on what the official story is on Mac, which should ostensibly be similar to Linux in the way it handles theming. Also, for you Mac users out there that can't stand the burning light of a thousand suns every time you need to sling a file around on the internet, turns out Cyberduck is a free and open-source (GPL) FTP/SSH client for macOS that has a dark mode and offers a server. I'm gonna give it a try. Registered purely to say that your response to this is absolutely ridiculous- and to be quite frank it's kinda ignorant too. Firstly, I fail to see how implementing a dark mode would even remotely equate to filezilla being a "toy app". There are 100% legitimate, practical reasons for wanting this. I was looking for this exact feature, because after I've been working on something for 12-14 hours straight in a dark room, I dread opening Filezilla. Because I'm now all too familiar with the sensation of my retinas burning when I do, given that it's basically the only program that I work with that doesn't include a dark mode. And compared to some of the software I'm using (which, incidentally, does include a dark mode. ), Filezilla might as well be a toy app. And quite evidently, it does not use the system colours provided by Windows in the current iteration of the OS. Blaming Microsoft for your software lacking features is pretty poor. This isn't the kind of thing that the software should have to rely on the OS to provide, given that 99% of professional software packages now include some kind of dark UI mode not only as standard, but even by default in many cases. To be perfectly honest, this (along side your response) makes me consider switching to another client. Not the most elegant solution, but it works: You can use the High Contrast (Black) or one of the other High Contrast themes (except High Contrast (white)). FileZilla will be in in Dark mode, then, like the rest of the OS. Helps with burning retinas. You might also search for a dark Desktop theme online. The themes themselves are still supported. I've seen a few on DeviantArts.